Edinburgh is a great place to start your motorhome holiday, this versatile city has plenty on offer for you to see and do, Holyrood palace in Edinburgh is the official residence of the royal family in Scotland also hosts Scotland’s Government, parliament as well as the supreme court and after London is the Uk’s most popular tourist destination. Shopping on princess street which also holds a German Christmas market in the winter months and in the summer you can find farmers market on a Saturday. 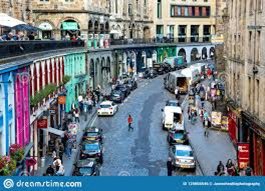 As well as shopping centres with high street stores, Edinburgh is also known for it is own specialist boutique stores as well its designers stores, its even rumoured that JK Rowling took inspiration from Victoria street for Diagon alley which features in her harry potter series. There is so much to choose from be it a burger and chips or for more special occasion try dinning out in a Michelin star restaurant. There is something to suit everyone’s budget and taste. Don’t forget to take a gin or whisky tour. For those interested in Architecture then a walk along the Edinburgh mile should be on your to do list blending the old and new, at the where beginning of the mile you start at Edinburgh castle and walk along to the palace of Holyrood the official residence of the queen when she’s in Edinburgh then across the street you also have the modern Scottish parliament buildings, as you walk along the mile there will be lots of alleys and lanes for you to explore as well as churches and historic buildings that you can admire with a coffee in one of the many coffee shops. The Edinburgh fringe is the world’s largest arts and culture festival, held in the summer over 3 weeks – there is thousands of performers some of which are well know who come to Edinburgh to entertain, many of the artists are not know and use the fringe as a platform to build their career. Artists range from authors, comedians, clowns, opera singers, circus acts, dancers and the list goes on but there is something for everyone. Fun for the kids the kids will not be bored neither with a range of activities a visit to the dynamic earth or Edinburgh castle blends fun and education together, or for those more interested in nature there is Edinburgh zoo or butterfly world. For those into a more active experience there is always the climbing wall or a visit to the dungeons. Morton hall caravan park is only 15 minutes from the centre of Edinburgh and has good transport links into the centre with good reviews on trip advisor for it being a clean and friendly site. Linwater camping and caravan park has good transport link and winner of the 2018 Best Caravan Park ensure you a clean and comfortable pitch for sightseeing in Edinburgh. Edinburgh is a great starting point for a motorhome holiday and with the upgrading of the tram network and improved travel links there is some fantastic campsite on the outskirts of the city centre where you can take public transport in to the city centre. One you have spent a few days exploring Edinburgh you will be ready to start you adventure into the highlands of Scotland. please see our blogs for inspiration for your next motorhome holiday. 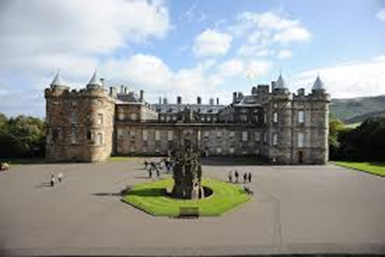 We are located in Perth Scotland, approximately 40 Minutes from Edinburgh Airport . We do not cover Aberdeen or Prestwick airports. For your comfort and safety we have a dedicated fully insured shuttle Bus for our Motorhome Hire customers, We collect and return from Edinburgh, We can also collect and return you to your hotel, Transfers from Perth Rail Station are free for all our customers. If you require Transfers please ask for a quote, and this will be built in to your overall Motorhome Hire holiday package with us.